Direct Traders have the ability to enter orders on behalf of customers who's TTORD is mapped to the Direct Trader's Membership (M) and Group (G). 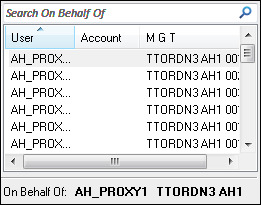 Note: You must have credentials within TT User Setup to be able to place an On Behalf Of (OBO) order. Tip: You can also set a default OBO user within Customer Defaults. Select the desired order gateway or broker. Click Account or On Behalf Of in the Order Pane to open the Routing Configuration dialog box. The OBO search window appears. Search by account, user, or MGT for quicker seeding of OBO orders. Click to select the desired username to send the order on behalf of. Click the Buy or Sell column at the price level where you want to place the order.